I recently posted the ten items on a list of features Jerry Stark suggested best describe the ressentiment felt by a great many people in this country at the present time — as reflected in their continued support of an incompetent president. In doing so I may have suggested that this was the dominant thinking of a majority of people in this country. Jerry recently posted a comment in which he tells us such is almost certainly not the case. He guesses this is about one-third of the people: there are other forces at work in our troubled country at this time, some of which must give us hope. (1) An appreciation, not merely a tolerance, of cultural diversity. (2) A skepticism about how well traditional institutions and traditional institutional leaders serve the public– corporations, religions, governments, schools, etc. (3) The traditional gender stereotypes of males and females are widely questioned, to the point where they are regarded as irrelevant or harmful. (5) A greater commitment to political engagement and increased support for candidates who challenge traditional party platforms and candidates. (6) A high regard for science and technology, and a subsequent acceptance of the reality and critical importance of climate change. This list is broadly stated. It leaves much room for specifics and nuances, to be sure. The [previously posted] list of emergent moral standards [that appear to be dominant at the present time] is depressing. No question about that. Equally depressing is that it represents the thinking of almost a third of the adults in this country. That is also frightening, but bear in mind that this sector of the population tends to be older, Evangelical, Republican, disproportionately rural, male, and white. This category of the public will not last long, as a simple matter of demographics; further, this sector is shrinking politically. One of the reasons the support for Trump appears to be rising among his base of Republicans [percentage-wise] is precisely because the number of people who call themselves such is steadily diminishing. This leaves the harder-core supporters representing a larger percentage of Republicans without an increase in their actual numbers. The same holds true for Evangelicals, whom I hesitate to refer to as Christians. The sector of the population likely to express opposition to the emergent morality listed in [the earlier] post also appears at this point to be about a third of the populace. Crucially, however, it is younger and growing. It is increasingly non-white, it includes a wider variety of religious and non-religious views, it has little faith in the so-called “free market,” it is more urban and suburban, and it strongly values economic and social fairness. Whatever the attitudes this sector of the population bring to the table, one important point is unavoidable: these people will be around for a long time. Republicans have known this for decades and have been working to take over state and local governments, to undermine labor, to defund the public sector, to rig elections, to pack the courts, and even to pursue amending the Constitution to maintain the power of wealth and whiteness in this country. To a remarkable degree, they have succeeded. The ultimate measure of the success conservatives have enjoyed in the past forty years will depend largely upon whether this emerging third of the population does, indeed, develop and act upon a conscious ressentiment of its own. An inflection point where this country could go one way or the other appears close at hand. I would only question the depth of the commitment of the young to the political process [#5 above], since that commitment seems a bit whimsical. But when the voice of the young is heard it can be effective, to be sure. And I do wonder what will happen if and when the remaining third of the population of this country, if it is not thoroughly “pro-establishment,” wakes up and becomes politically active. In any event, Jerry suggests that his ideas are still aborning. So I urge those of you who are interested to revisit his latest comment to the post mentioned above. What he has provided us with is an insight into the darkness of our current cultural ethos, and I thank him for that. That’s what this blog is for: to stir up the mud a bit and get us to think.It is anything but simple, but it demands that we take notice since, however we slice it, we are in the midst of a cultural revolution — for better or worse. I was a bit dismayed by the lack of response to a guest blog I posted not long ago written by Jerry Stark. It struck me as extremely insightful and even a bit alarming. It is certainly worth a moment’s reflection. If Jerry is correct then we are in the midst of a revolution — which may or may not be a bad thing. Thomas Jefferson thought we needed a revolution every 20 years to clear the air, as it were! But this revolution is assuredly not a good thing, I fear, as it radically alters our perception of our world and other people in decidedly negative ways. I suspect it goes hand in glove with our cultural narcissism and may be exacerbated by our numerous fears and uncertainties. At the very least, it expresses the ressentiment of a growing number of people in this country who feel disenfranchised, excluded from the centers of power and influence, on the outside looking in. In any event, I have selected the ten points that Jerry lists as evidence of the revolution in our thinking and will leave it to my readers to decide whether or not this alteration is a good thing — or indeed if it is widespread. I cannot argue against the fact that it is taking place. The only question is whether or not we will benefit from it in the long run. After all, like the oligarchy that has replaced our Republic, it replaces much of Western Civilization as we have known it for hundreds of years. (1) There is no truth other than the truth of the powerful. Any truth other than that of the powerful is not only false and fake; it is evil. The Leader is the source of Truth. (2) Bigotry in defense of white supremacy is good. Non-white people are inferior. Social equality between races and religions is a dangerous lie. (3) Nationalism, nativism and authoritarianism are good. Globalism, cosmopolitanism, and intellectualism are forms of weakness. (4) Men are superior to women. (5) Christians are superior to non-Christians. (6) Real Americans, that is white Americans, are superior to all others. (7) Strength is better than weakness. Military and economic strength are all important. Diplomacy and cooperation are signs of weakness. (8) The strong are morally worthy; the weak are morally unworthy. (9) Leadership is action for its own sake. Destruction is better than reform. Intelligence and policy analyses are unnecessary. All that is required is the will to act decisively and to prevail — in Trump’s words, to be a winner. (10) Ignorance is virtue; intellect is vice. The point of all this is to aid us in understanding the thin veneer of civilization that we take for granted and which is so easily peeled away during times of crisis, when law and order disappear and chaos is embraced in the name of liberty. We must pause as we look around today and see the gradual deterioration of respect for law (in many cases deserved), the call to arms brought about by the terror that has been turned loose in our churches and schools, the fear that seems to dictate action, and the tendency of each to claim the “right” to do whatever he or she wants to do without any regard for the “rights” of others to whom we once insisted we have responsibilities. As Carlyle notes in passing, “without good morals Liberty is impossible.” And yet so many today insist that “good morals” are a fiction, that ethics and morality are simply a matter of personal opinion and gut feelings. The moral high ground disappeared with the death of Martin Luther King, some might say. So we arm ourselves and we demand the freedom to do whatever we want without restraint. And to assure us of this liberty we elect a clown whose only claim to the highest office in this country was his promise to provide his followers with unlimited liberty to do as they want, without the interference of governments and restraints of any kind. Surely, as we face the prospect of all citizens, including teachers of the young, arming themselves out of the very real fear of sudden terror and total chaos, the handwriting is on the wall: we must consider the possibility that we are at present witnessing the birth of a new barbarism. Civilization which is above all else the will to live in common is all but withering away –unless we refuse to allow it to happen! Carlyle worried that the revolutionary spirit would infect the English where there were thousands of disenfranchised people, downtrodden and poor, and a government that had lost the trust of the citizens. England avoided that revolution for a number of reasons, but it remains a possibility not only for that country but for any country that wallows in fear and hatred, insists that freedom viewed as the absence of restraint is a paramount value, and ignores the poor — where bloated politicians promise everyone that complete freedom and prosperity are theirs for the asking when, in fact, there cannot be any as long as those who hold the purse strings keep them tied tight and we hate and fear one another. It is well known that Thomas Jefferson held fast throughout his life to the conviction that nations should experience a revolution every generation. While he was not averse to a violent revolution, if necessary, he preferred (as did all Enlightenment thinkers) that these revolutions be guided by reason and whatever changes came about, however radical, should come about slowly and peacefully. Late in his life he wrote a strange essay in which he developed his theory of continual revolutions that were, in his view, the only guarantee of individual liberty against the relentless encroachment of the power of the political state. The essay was called “The Earth Belongs To The Living,” and it spells out the conditions Jefferson, as an avid reader of history, perceived to be the conditions of despotism that always precede violent revolutions. The essay was read and commented on by Jefferson’s close friend James Madison but in general it has been dismissed by many historians as “the dream of a theorist” and not taken seriously. One of the few historians to take the essay seriously — and to take Jefferson at his word about the need for continual revolutions — was Daniel Sisson, who, in his book The American Revolution of 1800, provides us with a careful, if overly favorable, study of Jefferson’s attitudes toward revolution and his commitment to the notion that his own election to the Presidency was itself a revolution in that it marked a radical change in the political life of America, which was tending toward Federalism and even the reestablishment of a monarchy — which is to say, the growing satisfaction on the part of the general population with an increase of central power. Jefferson saw his Presidency as an opportunity to return the nation to the people and place the sovereignty where it belonged, in the hands of the citizens, and lay to rest once and for all the desire that this nation should be governed by a monarch. Those conditions [Jefferson] enumerated at the end of his letter [to Madison] had been present in all despotisms throughout history and were particularly characteristic of the ancient regimes yet in power. Further, they could be summarized as those conditions that existed in America from 1760 to 1775: attempts by the government in power to maintain its authority were gradually undermined; laws became arbitrary; ‘obligations,’ once bearable, became ‘impositions’; traditional loyalties faded and new forms of attachment (outside the existing circle of government) became noticeable — the idea of community no longer held people’s attention to the interests of the nation; factions arose that exploited the frustrated classes in society; representatives no longer were representative, but spoke for the privileged few; accepted forms of wealth and income suddenly appeared corrupt or ‘ill-gained’; existing concepts of prestige changed; those people with talent, normally integrated into society, began to feel ‘left out.’ Indeed, this is the picture of an . . . emerging dialectic of two competing cultural systems warring against each other in the same society. Santayana has told us that we need to read history or we will repeat its mistakes. Jefferson took that notion seriously and we should as well. The conditions Jefferson describes for us resemble in so many ways the conditions that persist in contemporary America. As Sisson points out, these are conditions that can lead to revolution or even to civil war. But there are mitigating factors at work in America today that may well prevent that from happening: schools that do not educate but simply train people to find mind-numbing jobs; news media that have degenerated to the level of mere entertainment, coupled with entertainment directed at a grammar-school mentality; electronic toys that mesmerize and lower I.Q. ; and wide-spread apathy brought on by complacency and ignorance. If Jefferson is right, then this translates into the loss of individual liberty — the very thing a republic was established to protect and preserve. But the majority of Americans seem unaware of this fact, or they just don’t care. I was once told that the title phrase I have used here is an oxymoron. I am beginning to believe it is. The determination of those folks in uniform to use their deadly toys to “win” wars that no longer can have winners and simply breed new enemies is marginally stupid. It is not that surprising, however, when we consider the narrow minds that control a military organization that is focused entirely on one thing: fighting a war. No doubt, these people are sincere, not to say zealous. And that’s the problem, especially when the Commander In Chief they answer to seems to be intimidated by the uniform and willing to go along with pretty much any plan they come up with. History has taught us to be more circumspect. During its infancy our nation was struggling to come to grips with the difficult problems of self-government. After the British were defeated and the states had ratified the Constitution, George Washington was the leader of a nation that was struggling to find its way in a confusing world without a road map. There were as yet no political parties, but there was a wide variety of groups who all thought they knew the best way to do things. The two major groups were led by Thomas Jefferson and Alexander Hamilton, respectively. The former was concerned that the country maintain its republican principles and never again allow itself to be governed by a despot. The latter had aspirations to great power and a disarming fondness for things English. 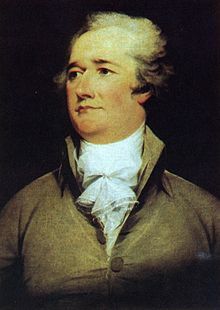 There was every reason to believe that Alexander Hamilton wanted to restore the monarchy, because he saw the republic as a nation of rabble who had no idea how to do the right thing. The battles in print between Jefferson (and his friend Madison) and Hamilton make interesting reading. But what is most interesting is the fact that on nearly every key decision that came up in Washington’s cabinet the president sided with Hamilton, his Secretary of the Treasury. Jefferson, his Secretary of State, was repeatedly left wondering what went wrong. It’s not that Washington didn’t have confidence in Jefferson. On the contrary. But Hamilton was his aide-de-camp during the revolutionary war and as a close military friend he had Washington’s ear, and was clearly his fair-haired boy. When there was an uproar in Western Pennsylvania — later called the “Whiskey Rebellion” — Washington promoted Hamilton to the rank of General and put him in charge of a force of 15,000 men to quell the disturbance. This showed poor judgment on Washington’s part and led both Jefferson and Madison to worry that the appointment was a sign of senility on Washington’s part. Both men were horrified: this was a nation founded on the principle of no standing army and here was one in their own back yard — lead by a man who had lofty aspirations and limitless ambition — and who regarded Julius Caesar as the greatest man who ever lived! Both Jefferson and Madison were convinced that this was the first step toward a counter-revolution, like the one they had recently witnessed in France. As it turned out, they were wrong — barely. These are the garbled words of Rick Perry who is referring to President Obama whom he calls, in the same interview, a “socialist.” I have spoken about scare words like “socialist” in an earlier blog, so I won’t go there. I would prefer to reflect on the longer comment about the values Perry thinks this country was founded upon. One must wonder whether he ever read any of the founders’ words! Almost to a man, even the staunch Federalists had deep reservations about unbridled capitalism. They tried in any number of ways to put reins on human greed and see to it that no one became so wealthy they were a threat to found a new aristocracy. One of the most common steps taken by every colony was to write into law prohibitions against “primogeniture”: the ability of a father to pass along his entire wealth to his eldest son. By the time of the Revolution all of the colonies had outlawed this practice, choosing instead a more equitable distribution of wealth through wills — what was called “partible inheritance.” The idea was to spread the wealth as much as possible and not allow it to accumulate in the hands of a few who would then become powerful, or worse yet, aristocratic. It didn’t always work that way, of course, but the point is that the values this country were founded upon are not to be found in raw, unbridled capitalism. Though most of the founders were not Puritans, they espoused largely Puritan values — such things as industry, courage, charity, and thrift. That is, the values that were prominent in the eighteenth century were other-directed and most assuredly unrelated to the “return on your investment.” Perry is deluded and is simply trying to re-write history as he slanders the President. What he says is hogwash. When we take these words together with candidate Michele Bachmann’s praise of the residents of New Hampshire for the courage their ancestors showed in the local battle of Lexington and Concord, we must assume that the corporations who back these candidates don’t choose them for their intelligence and knowledge of history, but for their malleability. It would be wise to brace ourselves: there will be more of this sort of nonsense in the coming months, not less.